For those who have no idea what Four Square is, think of it like Twitter, with maps. Using your mobile phone, you can quickly “check-in” at any location you’re at. Friends that you follow appear as they check-in with the service. And continuing the Twitter likening, the service can “tweet” your check-in, complete with an address. DarrenBarefoot.com has a nice piece on it. The service likes to promote this as a way for people to see what you’re doing and go meet up with you, but I think it’s more like a way to find our more about your town. Someone’s having a good meal at a restaurant you’d never hear of? Add it to your to-do list. Done! And it’s way more intuitive than dumping your phone’s GPS coordinates into a tweet. Someone has some good information about a location, some handy tip? They can add that for you to find as well. So far the service is growing, which is good, as it means more feedback about your town. Or even better, as I discovered in my holiday trip back East, it means more feedback from towns your are visiting! A quick snap-shot of your alien surroundings! It’s possible another service will replace this one, but the current trends tends towards services linking together, rather than trying to be everything to everyone (as mentioned, Four Square already links to Twitter. It also links you to a Facebook account. In fact, you do not have to sign up to yet another website, instead you can just use your Facebook account.) For now, Four Square appears to be stable and growing. All from the comfort o your couch! The future is here! I didn’t win Best-kept Vancouver Secret, so I don’t care, but there’s a lot of other categories to go through – some are a perennial (Best Place For Cheap Drinks – The Cambie) and some are a surprise (Best Place to Pimp Your Ride – Canadian Tire. I’m not saying it’s wrong, but it’s a surprise). Always worth a look – check it out online or grab today’s issue before they’re gone. Anybody or any place that you’d recommend that didn’t win or get runner-up (either because there wasn’t a catagory for it, or the world is unjust and Vancouver wouldn’t know a good -insert store or job here- if they tripped over it)? I’ve got a few. Hair Salon – I’ve got two, because my stylist moved shops. Mine Salon at Main and Broadway and Clover, downtown. I don’t need a stylist, if you’ve ever met me. I’m well past my hip prime and maximum hair potential, but therein lies the main reason I found and stuck to my favorite stylist after moving here – I can get a $12 haircut every two weeks and look like a mushroom half the time, or I can pay a reasonable salon price and it will be fine for two months, if worse comes to worse. Gentlemen… good advice. Think about it. Comic Shop – Why was there no listing for Comic shops? I can think of five inside or just outside the downtown core. Personally, I prefer Elfsar (Yaletown) or RX (Main), but there are enough of them that a vote would be nice. And depending on how far out the net can be cast, there are a lot more that just five – with the new Canada Line, Imperial Hobbies in Richmond is just as easy to get to as Golden Age. Maybe easier. Video Store – C’mon. We live in city that has managed to not only retain independant video stores, but it’s slowly expanding. Happy Bats (Main)? Black Dog (Cambie)? Grindhouse (W. 4th)? And Videomatica, of course. This town is full of great places, I’m not sure I like the idea of narrowing it down to a list of three of four. It seems wrong somehow. But, it’s also nice to be recognized for doing a good job, right? There’s a hell of a lot of decisions to make when organizing a wedding, and for most of the important ones I had nothing to do with them for mine. Probably the best decision made for our wedding, apart from the actual getting married bit, was hiring Photobooth Vancouver [pbv] for two hours of photobooth services. Lydia had found them at a indie bride event at the same venue we were getting married, the Heritage Hall, and decided that they were the coolest thing she’d ever seen. So for $300 an hour we had two hours of photoboothing for our friends and family to enjoy. The guests loved it, and as with your traditional photobooths they all got their own photos to take and keep at no charge to them. Then about two weeks later we got a disc full of all of the photos that had been taken through out the night so that we had a new and fairly novel way of remembering our wedding and those people who were there. Granted I personally don’t look particularly good in any of the photos, having swelled to the fattest point in my life just in case I needed some extra padding for the wedding, but they’re still great to look at. 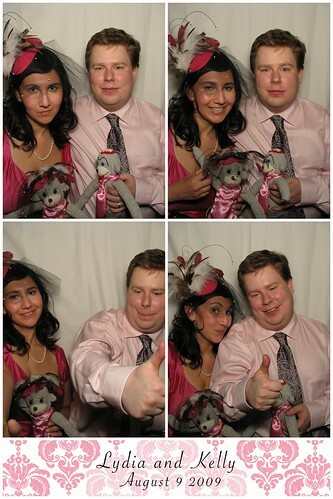 And trust me, the photobooth is about the only thing that anyone remembers about the wedding. So if you’re organizing any kind of party or event I’d give serious consideration to having Photobooth Vancouver there. It’s great fun, and it’ll be a great way to have a unique souvenier of the event. Vancouverites, you’ll have to help me out with this – this isn’t a phenomenon I saw much of growing up across Canada. Like, maybe once. Now it’s everywhere. People jacking up houses, entirely renovating the old structure into something new, and usually something with a basement suite to rent out. I think the first one I saw was around 5 years ago on Elgin street and it kind of blew my mind. They weren’t just adding a new basement foundation, they were creating a whole new ground floor – and that’s a considerable amount of lifting, compared to propping up a house, maybe jacking it a couple of extra feet to allow bigger basement windows. It wasn’t until I saw the final result that I saw the point was to create one suite upstairs, and another suite downstairs that is almost as attractive as the upstairs as it is more a walk-in suite than a basement suite. Now I’m seeing this everywhere. Is it zoning, as in it’s harder to get a new design approved for areas, but a literal gutting of a house, while retaining the original shape is ok? Or is it a cost thing? Is it cheaper to retain the frame of a house, than to tear it all down and start from scratch? Or a combo of the two? The house is almost done now, but imagine with me; take the right side of the building, as you see it. That’s the original house – the left is a mirror image of the right that didn’t originally exist. Instead it was some asymmetrical, narrower portion of the house. This whole house was jacked up, the ugly left cut off, a new basement poured, and then the right was mirrored, leaving a duplex with a basement suite. It is ingenious. 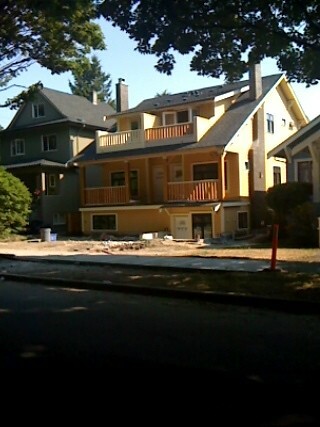 Anybody else seen any good renos in Vancouver lately? Free Comic Book Day 2009 – Today, May 2nd! It’s this day, this year, and you get free comics at your local comic shop. Pretty straight forward, eh? But seriously – Free Comic Book Day is an annual event, held on the first Saturday of May. Besides being a great way to promote comics and reading, comic shops have individually turned them into mini-conventions, with prizes, costumes, local creators, games, special sales, and even charity work. While to you it is a day of free comics (check the list! ), each store buys these comics. The publishers have discounted them to varying degrees (as gold and silver sponsors) , but the shops still pay for them (and considering they bring in hundreds of books for the event, that can add up), so please check your store’s preferences – most have a limit per person, which you can then exceed by paying a nominal price, making a donation to charity, etc. In fact, some regular customers make it a point to toss them some coin anyhow – what’s a couple of bucks, a fiver, or some cans of soup for a fistful of comics? Find Your Local Comic Shop! Big shouts out to RX Comics, The Comic Shop, Golden Age, Imperial Hobbies, Lucky’s, and Elfsar, which I’m linking to because a) I have an account there, and b) the sheer volume of stuff they pack into their FCBD is insane – be sure to bring non-perishable offerings for the Vancouver Foodbank. Posted in Around Town, Vancouver Life | Comments Off on Free Comic Book Day 2009 – Today, May 2nd! When did egg hunting events become popular? I understand both the Christian, Pagan, and marketing aspects of the Easter egg hunt tradition, but this year I’m a little puzzled – we got a flyler/invite in the mail to take our kids (which we don’t have) to Cambie Village for their annual egg hunt. A little more digging and it turns out there are a lot of community level oeuf hunting events, many with limited tickets – first come first served. Is this typical? Is it more of a now thing than yesteryear? I hunted for chocolates in the living room. My parents hunted for real eggs in the yard. So, when did it become The Thing to attend the local equivalent of the White House egg hunt? And just how many hiding places are there in a community center gym? I remember when the circumstances that helped create Pink Shirt Day first happened – it was one of the notable stories of the week, September of 2007. It had a John Hughes film quality to it – a new student attends his first day of classes at a rural high-school in Nova Scotia, wearing a pink Polo shirt. Fair enough – Polo is always a solid choice and in 2007, I think pink was supposed to be the new black. No problem there, not counting the high-school bullies. Surprising to nobody that’s ever attended high-school, they went to work on the new kid, verbally beating him down with the bluntest instrument in the vocabulary of teenage boys everywhere; homo. The surprising, almost unbelievable part of the story is that two Grade 12 students took offence on behalf of the younger Grade 9 classmate, and using their own money, a discount clothing store, and online social networking, they bought 50 pink t-shirts and handed them out at the school door the next day. And the 50 was supplemented by even more students that wore their own pink apparel. It seems like an obvious twofer – get an awesome excuse to wear that pink sweater AND stick it to the thuggish common denominator at the same time. Anyhow, happy ending – the new student’s confidence is restored, two grade 12 students are national heroes (Go Canada! ), and the bullies are doing whatever it is bullies do when they don’t get their way. Smoking, carving things into desks, and punching one another in the arm, one would imagine. Most of us aren’t in high-school any more, but we were all there once. And at least in some small way, the kids around us aspire to be us – independant and critical thinkers. And to be honest, we’re all better looking people now anyhow. Plus black and pink looks awesome, hipsters. So, why not show a little support on Feb. 25th? Pull on some pink, and wherever possible, pass this along to your friends. The perfect Hollywood ending for this story is if the actions of two clever young men trigger and annual, international event. It’s the Parade of the Lost Souls on Commercial Drive (Grandview Park) this evening. Assemble at 6:30 pm, parade at 7. Shut-ins and the antisocial can watch the live stream. So it’s been awhile since you’ve touched an animal, and you figure you should. You know now that more people live in cities than rural areas throughout the world too few of us have really ever had our clothes chewed on by goats. It’s that sort of one-on-one nature experiance that keeps us grounded. My answer to you, for all your animal touching needs, is North Vancouver’s Maplewood Farms [mwf], which is a great petting zoo. For just $4.90, $2.85 for anyone 16 and under or 65 and older, there’s a whole lot of farm animals waiting to be petted. Okay, I’ll be honest this is one of the few things I’ve ever blogged here about where you probably should take kids to. As part of a late twenty-something couple I felt slightly out of place in a park dominated by pre-teen children and their harried parents. It was still however fun, and a good photo oppertunity, but for the most part kids will get more out of it than adults. I’m going to meander a bit on my way to a point – I’ll probably do that a lot in the coming weeks, but hopefully you’ll come to regard that as a certain sort of value. Many years ago I got fed up with $12 haircuts. While I didn’t exactly require a lot of hair care, what with keeping it short all the time, I found the magic-cuts only lasted for a couple of days and then I looked like my head was a prank gone wrong. So, I asked around and a co-worker suggested a friend who worked at the now gone gone gone Stratosphere salon. They had great music, Shelley was wizard enough to know how to cut my hair so that it could grow in for weeks and not make me look like a fuzzy mushroom (perfect for a lazy procrastinator like myself who didn’t want to do the every-two-weeks thing) and best of all, it was behind the offices, just across Hamilton. Nice! Anyhow, Shelley eventually moved out of downtown to go work at Mine Stylesource on Broadway (or Mine Hair, as I like to call it – say it with a bad German accent, you’ll get it), which is owned by one Anthony Crosfield (here comes the point!) Very nice guy, very entrenched in Mount Pleasant, judging by the way I keep running into him and Mine staffers all over the place. And he’s a winner! Not in the general, everyone’s a winner sense. He’s this year’s hair superstar on the Superstar Hair Challenge! If you’ve never seen the show, you can probably guess the format – a selection of people in a certain profession (in this case, hair stylists) compete every week in some profession themed contest, and losers are invited to take a teary hike, one at a time. And after 7 weeks (or, more likely 7 days carefully of shooting that’s parceled out over 7 weeks), it came down to Anthony and two other stylists, and Anthony won the day. Only, I just found out about it today – and he won last week. See, I’m not a reality TV guy, so the only way I found out about this was walking part his salon and seeing a poster for the show in the window. Hey, I know him! And it’s on tonight! I will watch as a show of support. And just my luck, it was all over. So, no TV for me, but a big congrats to Anthony – and hey, all is not lost. Slice (which was airing the show) has all 7 episodes up online. I’ll watch it online, just because it’s one of the few sites that isn’t Bogarting their video just because I’m not on their side of the border! Plus, one episode has twins, so… rawr.